DVD. 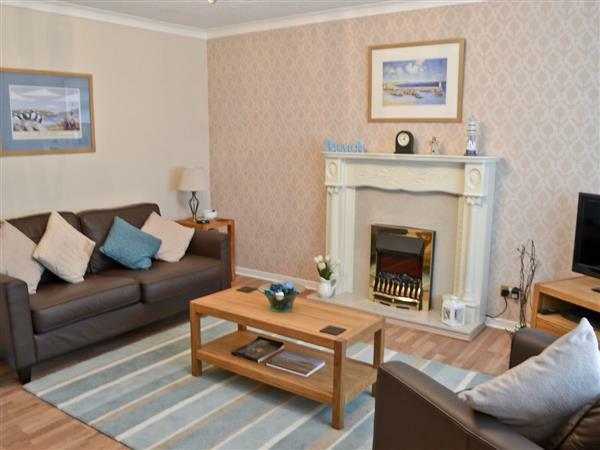 Just a few minutes’ walk from the centre of this friendly seaside village, Seahouses appeals to all ages with golden St Aidan’s beach, fish and chip shops, pubs, restaurants and gift shops. Take a boat trip from the harbour to the Farne Islands where you can view seals and many birds. Explore the coastline, castles, sandy beaches and friendly villages. Holy Island, reached via causeway at low tide, makes a great day out. Visit the historic town of Alnwick, 12 miles, with castle and amazing water gardens. Bamburgh Castle and beach, 3 miles. Golf courses nearby. Shop, pub and restaurant ½ mile. Ground floor: Living room. Dining room/kitchen with French doors and laminate floor. Garden room. First floor: 2 bedrooms: 1 double, 1 twin. Bathroom with bath, shower cubicle and toilet. Oil central heating, electric, bed linen and towels included. Two Freeview TVs. DVDs. Electric cooker. Microwave. Washing machine, t/dryer, d/washer, freezer (in garage). Garden area and furniture. Garage (1 car). Cycle store. No smoking. Holidays at Aidan run from Saturday to Saturday. For a better idea of where Aidan is, you can see Aidan on the map below. Aidan is in Northumberland; should you be on the lookout for a special offer, you can find all the special offers in Northumberland. It's always worth checking to see what is on offer at the moment. Do you want to holiday near Aidan (28254), you can see other cottages within 25 miles of Aidan; have a look to find your perfect holiday location.